Dave Chisnall is still searching for his first major TV title since joining the PDC eight years ago. Chizzy was the only St Helens player to reach the semi-final stages of the Darts Masters at Milton Keynes over the weekend before his hopes of progressing were wrecked by recently crowned world champion Michael van Gerwen. The Dutchman, who went on to clinch the coveted trophy for the fifth year in succession, was in command for most of the contest after losing the first leg. It was the only time he trailed, taking three successive legs to move 3-1 in front and then increased his lead to 6-2. Chisnall hit back to reduce his arrears to 6-4, but Van Gerwen won the next three legs to give him breathing space and punished missed doubles from the St Helens ace to seal a 10-7 win with a 10-darter. It was a reality check for Chisnall who in the previous round had destroyed Stephen Bunting, hitting a staggering 10 180s and a 99 average in a 10-4 victory. 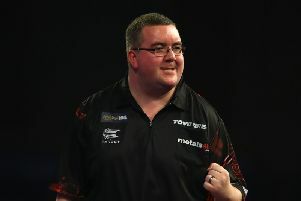 He started like a house on fire, claiming three maximums to lead 6-1 with his St Helens compatriot requiring a 14-dart finish just to claim a leg. Bunting cut the gap to 6-4 with back-to-back 104 checkouts, but Chisnall followed a 171 score with a two-dart 94 finish to keep his nose in front and reeled off the next three legs to seal a semi-final spot. 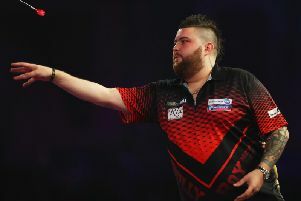 Michael Smith - St Helens' third representative in the tournament - fell at the quarter final hurdle, going down 10-6 to Perer 'Snakebite' Wright. Smith, who had reached the world championship final earlier in the year, found himself 6-4 down midway through the contest and despite a 98 finish and a 12-darter, his opponent took out 64, broke again on double 10 and then finished with 118. THE Premier League gets under way on Thursday night in Newcastle when world champion and Masters winner Michael van Gerwen comes face-to-face with Michael Smith in a repeat of last year's final which the Dutchman won.